The JRF report What will the housing market look like in 2040?, released yesterday, provided an eye-catching and headline-grabbing answer to the question that acts as its title. Presumably grabbing the headlines was the point. The answer is that under plausible assumptions about future trajectories on tenure, costs and incomes we are looking at a future of higher housing costs, more private renting, and a substantially increased incidence of poverty. 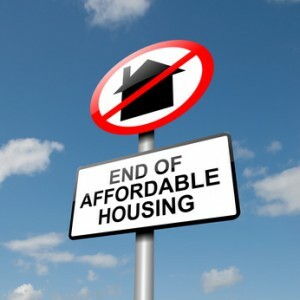 The authors, from Heriot Watt and Sheffield Universities, forecast that private renting will accommodate 20% of the population by 2040 and half of them will be living in poverty. The authors argue that four factors, all to an extent under policy control, could combine to prevent this unhappy outcome. We need to see housebuilding in England rise to 200,000 homes a year by the 2020s and 220,000 by the 2030s. We need the decline in the proportion of households living in social renting to be halted. We need social rents to remain indexed as they are at the moment to prices. And housing benefit needs to continue to meet the same share of housing costs as it does at present. If the stars align favourably in this way then the unpleasant future sketched out might be avoided. As Jules has observed, three of these variables are currently moving in the wrong direction, and while housebuilding may be picking up it isn’t looking all that chipper in the light of these targets. Jules also notes that the authors’ vision of the future is perhaps rather cautious. It isn’t implausible to think that current trends will result in 20% of the population in private renting by the end of the current decade, long before 2040. Also, Mark Stephens and his colleagues offer a couple of scenarios in the report for the future trajectory of social housing rents. The first is based on the current CPI+1% regime. The second is based on rents converging to 65% of median private rented sector rental value. This second scenario is taken as indicative of the impact of the affordable rent regime. It, perhaps not surprisingly, pushes up the incidence of poverty in social housing in 2040. However, it would be possible to argue that current policy trajectories make convergence on 80% of market rent by 2040 just as likely, if not more so. One can only speculate that modeling social rents at 80% market rents generated results too awful or incredible to contemplate releasing them into the public domain. But then, awful and incredible outcomes may well be what follows from the long term pursuit of the “affordable rent” approach. But all this really says is that predicting the long-term future is devilishly difficult. The research team have built on a well-established housing market model and plausible values for various key variables to derive one possible future. The aim in setting out that future is, presumably, to trigger a debate about the unpleasantness of the destination to which we’re heading unless housing policy thinking changes pretty sharpish. Arguing that the authors have rather understated the gravity of the situation only reinforces the point. It seems pretty clear that in that regard it is mission accomplished for the research. But if you only read the newspaper reports of the research then that would be unfortunate. The report is a work in several parts and, if I’m honest, it is the less headline-worthy parts that are probably more interesting. The first part of the report provides a useful review of the challenges in measuring both housing affordability and poverty. It then operationalises the concept of housing pathways in a way that allows longitudinal quantitative analysis. The results are based on 18 years of the British Household Panel Survey. The aim is to look at the way poverty articulates, or doesn’t, with housing deprivation. Poverty is treated as being of three types: temporary, recurrent and chronic. The study found that between 25-30% of people were living in poverty in any given year. that between 60 and 73 per cent of people who experienced housing deprivation also experienced chronic poverty during the study period. Overall, between 88 and 93 per cent of people who experienced housing deprivation experienced some form of poverty during the study period. However, only 12 per cent of people who experienced chronic poverty also experienced housing deprivation, compared to 9 per cent in the sample as a whole. Although people in chronic poverty are more likely to experience housing deprivation (as measured in the study) than the sample as a whole, more than 85 per cent of them did not experience housing deprivation at any point. It is also clear that the experience of poverty differs between pathways. Those who lived in owner occupation throughout the period of the survey were not less likely to experience poverty but their experience was more likely to be of temporary poverty. In contrast, those who had lived in social housing throughout the period were more likely to have experienced chronic poverty. Sandwiched in the middle of the report is a chapter looking at the spatial distribution of housing-related deprivation. The headline conclusion from this is that much housing-related deprivation is to be found in inner London. But we knew that. More interesting is that outside of London the distribution of housing deprivation is rather more varied, including in some very rural areas. The report provides some relatively fine grained maps demonstrating quite how localised housing deprivation is, even in areas such as Liverpool, which have the reputation of being more generally disadvantaged. Overall, there is plenty of interest in the report beyond the findings that grabbed the headlines. It has moved forward the discussion of the interaction of poverty and housing deprivation, and done so in a way that contributes to advancing the cause of housing pathways analysis. I’m presuming that this is the component of the team’s research that will eventually find its way into the academic literature. And so it should.